A hot sunny day was promised for my weekend and I was looking forward to doing some work at Mustang Maniac. What we had planned was to fit the rear bumper, that meant that the car was loaded up with my big shiny bits that had been hanging on the wall for the last two years. I arrived all nice a cool as the Aircon had been on full whack all the way down there. You may have noticed that I am in a different workshop now. I have been promoted! I am now in Adam’s finishing workshop where there is more room to have the doors open and not worry about the sides. A conversation with Adam about the plan for the day changed slightly. We decided it was time to put the lights into the front of the car and tidy up the wire loom. Of course the wire loom work means that there is virtually no difference to look at except the people who know. I mentioned to Adam that the wire loom wasn’t long enough to go to the right hand side of the car for the lights. Adam looked at the routing I had done for the wires which was lovely and neat and tidy by the way, and said they were in the wrong place that’s why. Originally I had ran the light loom through the chassis under the radiator to keep it all neat and hidden. Trouble is that the depth to go down the lower front chassis and back up again behind the battery meant I was about eight inches to short to meet up with the side or park lights. The main headlights would be fine as the wire was plenty long enough, so as I didn’t want to cut into the wires a re-route of the cable was the only option. I replaced the loom tape with the much nicer cloth loom tape to match the rest of the loom now, oh by the way – I seem to have shares in wire loom tape company now, the shares have shot up since I started on my car. With the routing in place where it originally should be the cables reached fine and I could actually cut them down a bit to the correct length. If you need to replace the parts like I did as most had gone to the great scrapyard in the sky then there are complete packs for the headlight assembly. The headlight bulbs are mounted behind the headlamp door which in turn exposes the retaining ring which is nice shiny bit of chrome, if you’re lucky. To replace the sealed beam is a fairly quick process, four screws on the headlight door and the three on the retaining ring. The bulb will fall forward and pull the loom plug off the back of the three spade connections. To refit, repeat the process in reverse. The bulbs I would be using are the H4 sealed unit bulbs to retain that stock look on the glass lens. There are modern alternatives that can be used in place but could require the bowl to be cut to allow them to be fitted correctly. As I have LED’s at the front so I will use them as daylight running too. 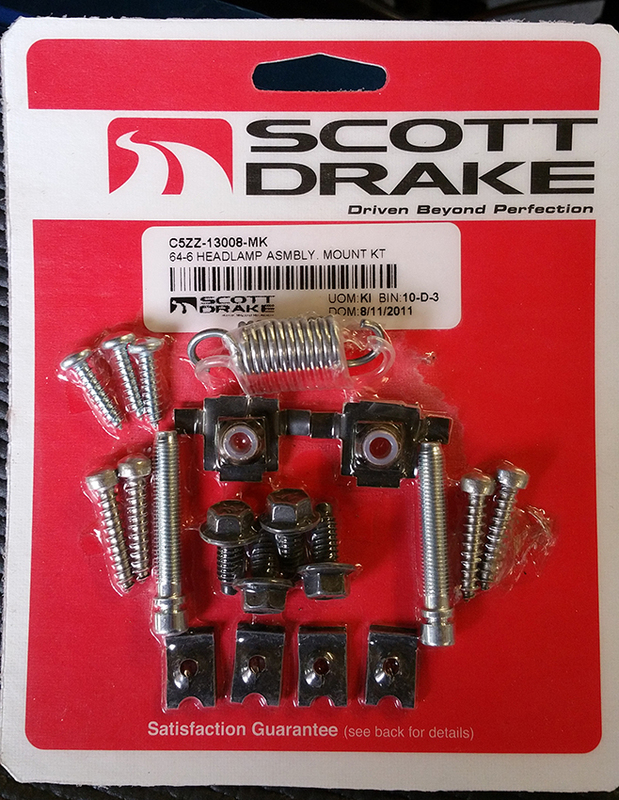 What I aim to do here is to show the complete headlight rebuild with the Scott Drake hardware kit. Attach the four new clips to the outside of the headlamp assembly making sure they are the correct way round with the threaded part to the back. Once these snap into place they can moved around by a couple of millimetres to enable the headlamp door to align to the fender correctly. The next part is slightly more tricky as the adjustment studded threads have to be fitted. The retaining clips for the studs has a white washer/nut in the middle. These clips are pressed into the holes at the top and side for the adjustment. The legs on each side stop the fittings falling through the to the back of the buckets. With the legs on the front side the backing part of the fitting needs to be pressed behind the headlamp bucket assembly. If these are to tight bend the legs slightly forward to enable the fitting to sit further back into the hole and allow it to slip behind the back plate into place. There is a small amount of movement here to allow the bowl to fit. There are two long threaded studs that have a recessed groove at the top. Screw the two studs into the nylon washer/nuts a few threads. Next it’s the headlight bowl itself, the only tricky part of this is the spring which I will explain in a couple of mins. Around the outside of the bowl there are two cut out lugs and a rectangle cut out. The lugs will locate in the collar of the studs. This will enable you to wind the stud either way to adjust the angles of the beam now. 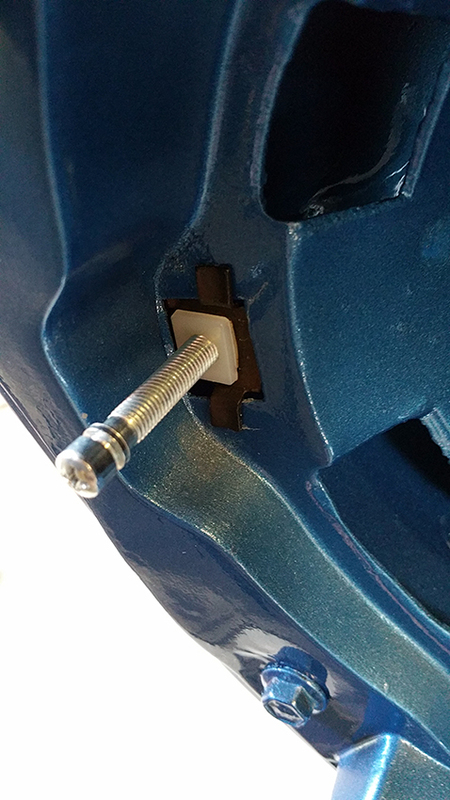 The bowl is a loose fit at this point, so a spring is required to pull the tension against the studs and to stop the lens itself moving around. The spring is located into a hole at the back of the bucket and pulled through the bowl opening at the bottom to create the tension. Previously I had made one of the spring tools, but as I had left it at home it was the old school way of a fitting, a good ol’ pair of pliers. If you are going to use pliers, I would strongly recommend a long nosed pair of pliers with a very good grip. The spring itself is quite strong and needs a little bend just to get the hook of the spring over the edge of the bowl into the retaining eye. With the bowl now in place you can add the bulb. Attach the loom connections to the back of the bulb and massage the wires into place at the back of the housing. (I couldn’t get pictures of this part as I didn’t want to drop the bulb). Holding the bulb in place fit the chrome ring around the outside of the bulb lens and to the bowl, screw lightly into place on the bowl to stop the bulb falling out. Repeat with the other two screws. The bulb is now in place and needs to be aligned up correctly. If the bulb is just a replacement then it should not need to be an adjusted. Adjust the beam with the studs to angle the lens on two axis points. With the ring screws now in place, in future you should be able to unscrew each retaining screw a few turns so that the chrome ring will twist a little and lift over the head of the retaining screws. This obviously makes it much easier for replacing the bulbs at a later date. Once the bulb is aligned the last job is to refit the headlight door. Screw into place lightly and align the headlight doors back up with the with the fenders bevelled edges. That’s it – job done, quite simple. The wire loom took up most of the day and to route the cables nicely. The bulbs on the other hand didn’t take long and have given the car a complete facelift and now it looks like a mustang again, even without the grill. We connected the battery up and checked the park lights and they worked fine. The main headlights didn’t work yet as they needed to have an earth connection under the dash for the relays. But, it was exciting to see the car spring to life with the lights, almost as if she winked at me! Thanks to Adam & Yogi who showed me the tips and tricks of the trade fitting the headlights. This entry was posted in General and tagged Adam, H4, headlight, Mustang, Mustang Maniac, One man and his Mustang, sealed beam, wire loom, Yogi. Bookmark the permalink. Thank you for the re – blog Bob. Wow, so much accomplished! PS Love the name you picked out. Also, I’m confident you could write down a few fitting lyrics! Details! Details! Details! She’s really looking great. Mustang Sally’s going to be really jealous. Thanks Timothy, it would be nice to have a song written about her. But I doubt it somehow. Lol. 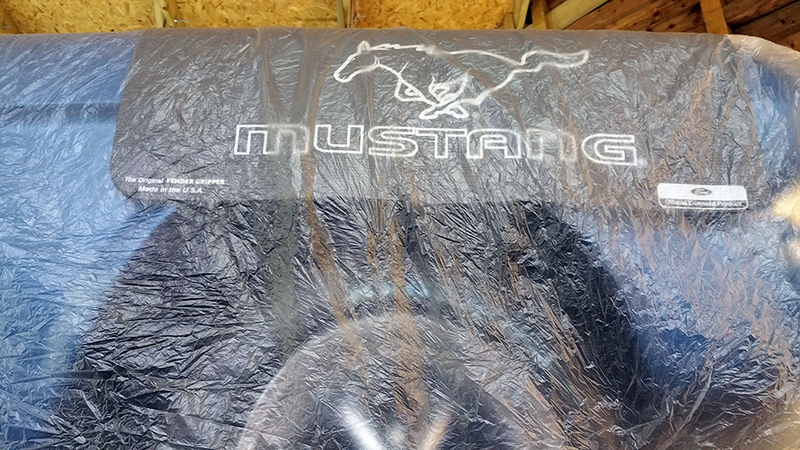 Have you a name for your Mustang? You might have mentioned one, but I’m not remembering it if you did. She’s getting there, Mart! She is in good hands, very meticulous hands.